So what did I make for our big Inauguration Dinner? Nada… I just reheated leftovers! 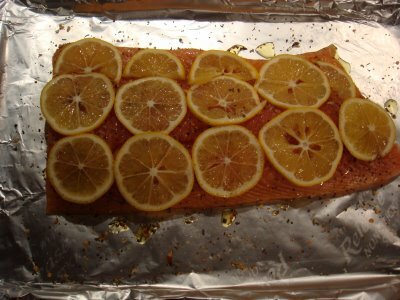 The previous night, I had purchases a nice slab of salmon and, wanting to use up the Meyer Lemons I bought, decided to oven roast it with some olive oil, lemons and seasoning. I rubbed the fish down with olive oil, gave it a good dose of fresh-ground sea salt and pepper and then added a spice blend of brown mustard seeds, lemon peel, onion, lemon thyme, chili pepper, celery seeds, bay leaves, basil, fennel, oregano and red pepper. 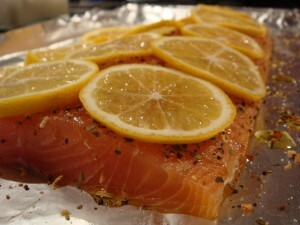 I topped the entire thing with thinly sliced Meyer lemons and put it in a 350 degree oven for about 30 minutes. The end result was moist and lemony. 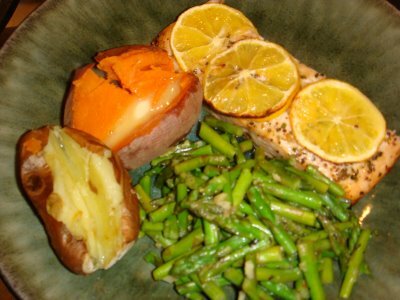 I served the salmon with garlicky asparagus and baby yams. There were plenty of leftovers, so we gobbled up the remnants for dinner last night and also had some of the edamame and celery slaw I made earlier in the day. The 4-yo finished off his dinner with a very patriotic dessert: Fat Free Cool Whip topped with fresh strawberries and blueberries. AND… I’m proud to say, we all ate AT the table together (the first time of the new year).